If you’re in Denver for a vacation, you’re in one of the most beautiful hubs in America. Uniting I-25 with I-70, Denver serves as the perfect capital for travelers and tourists, and its uniquely positioned as a gateway to some of the greatest scenic drives in the country. Remember, we’re always here to supply you with a sporty rental car to get you to your destination, wherever that may be! For 40 miles of beauty, adventure, and fun, you’ve got to take the car out onto Lariat Loop, a nearby National Scenic Byway. Lariat Loop weaves through the Rockies just to the west of Denver. With a quick jaunt down I-70, you’ll be able to jump onto the Lariat Loop to begin your adventures. Lariat Loop covers 40 miles of winding roads that bring you to a number of fun finds. As the Lariat Loop website points out, there are dozens of places to visit along the way. Check out the Coors brewery in Golden. And view the Buffalo Bill Grave and Museum. See Red Rocks, Colorado’s famous geological miracle: an amphitheater that’s naturally built into the landscape. Heck, you might be able to catch a show while you’re in town! If you’re willing to go a little more out of your way for an adventure, travel to Trail Ridge Road in Rocky Mountain National Park. While it’ll take about two hours to get to the park entrance (and Trail Ridge Road) from Denver, the sites are well worth the drive. View massive mountains, including Longs Peak, and ride over the Continental Divide from the comfort of your car. If you’re lucky enough to visit Rocky Mountain National Park during late September or early October, you may catch a glimpse of some of the most beautiful colors that only aspen leaves can provide. There are countless groves of aspen along Trail Ridge Road, so plan accordingly! You’re also very likely to see some wildlife throughout the park. 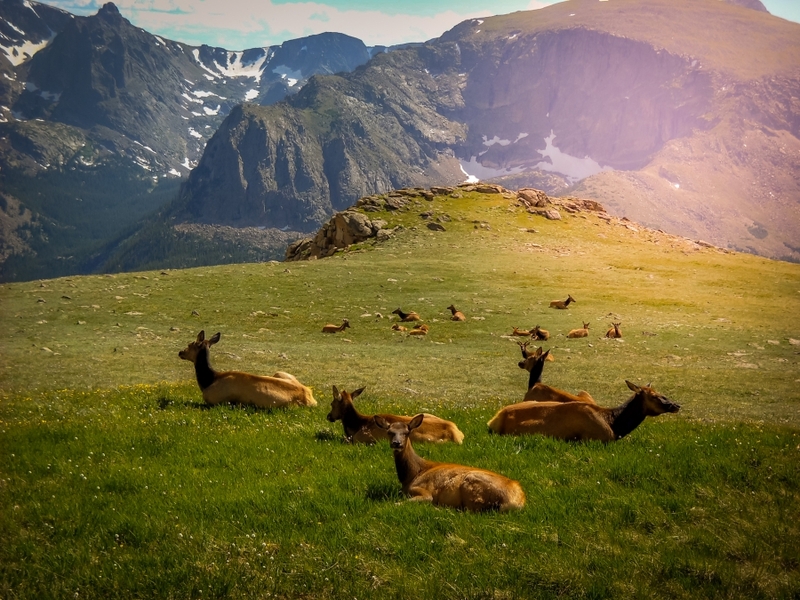 Rocky Mountain National Park is a sanctuary for animals, including elk, bear, moose, bighorn sheep, deer, fox, marmots, eagles, and the list goes on. There are pull-offs all along Trail Ridge Road, making it an ideal destination for wildlife fanatics and photographers. You can take I-70 east to US-40 north, and take a drive through Granby to highway 34—that’ll get you to Rocky Mountain National Park from the west side. Or you can take any number of roads to approach highway 34 from the east side—we’d recommend stopping off in Boulder or Nederland if you’re approaching the park from the east. Take note, Trail Ridge Road is closed in winter, since it becomes hazardous during the snowy seasons! Next stop, it’s time to check out the Mount Evans byway. Within a few hours of Denver, you can find yourself on top of Mount Evans, one of Colorado’s tallest peaks. The mountain is a whopping 14,130 feet in altitude, making it one of the famous fourteeners of our Centennial State. Like Trail Ridge Road, the Mount Evans byway will take you above treeline, where you’ll find that the tundra supports only the hardiest flora. You’re also likely to see pikas, marmots, and mountain goats along the road. Now, when you make it to the summit parking lot, you’ll still have to cover a little bit of ground on foot if you’d like to be at the very top of the mountain. If you’re planning on hiking the last few hundred feet, be sure to bring warm clothes (the top of the mountain gets very cold, even in summer), and bring water and a snack. If you’d like to explore Mount Evans, just take I-70 west until you hit Idaho Springs, and then you can follow highways 103 and 5 to make it to the summit of this gargantuan peak. Once again, take note that the Mount Evans byway is closed in winter due to road conditions. When you’re ready to take a load off and it the road, we have just the vehicle you need. 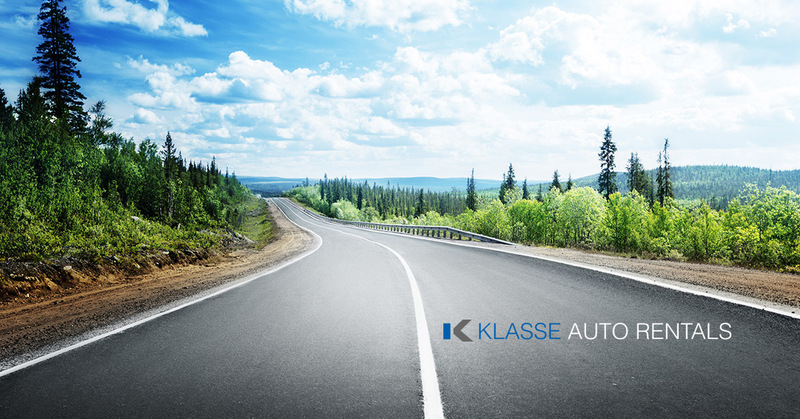 Here at Klasse Auto, we provide luxury auto rentals based out of Denver. Plus, we provide a variety of extra services, including airport pickup, luggage assistance, off-site pickup, and more. We strive to make it convenient to rent a luxury vehicle. Check our vehicle availability today!